A forest that waves like a ribbon up to 150 meters high around a glass skyscraper: the Vertical Forests rise in the cities around the world as efficient tools to fight the pollution. From construction sites in Greater Paris to Nanjing in China, from Utrecht in the Netherlands, or from Chavannes-près-Renens to Lausanne, the architecture begins to be covered with tall trees, to camouflage buildings in forests. The prototype of this kind of architecture is Vertical Forest, two residential towers inaugurated in 2014 in Milan, Italy, by the architect Stefano Boeri. Larch, cherry, apple, olive, pomergranate … The two buildings, 110 meters and 76 meters high carry on their deep balconies some 20 000 plants and trees, equal to as much as 2 hectares of forest. “These two towers are a prototype, it will take a few more years to measure all the effects, but they have allowed this concept to be finally taken seriously,” says the Milanese architect. 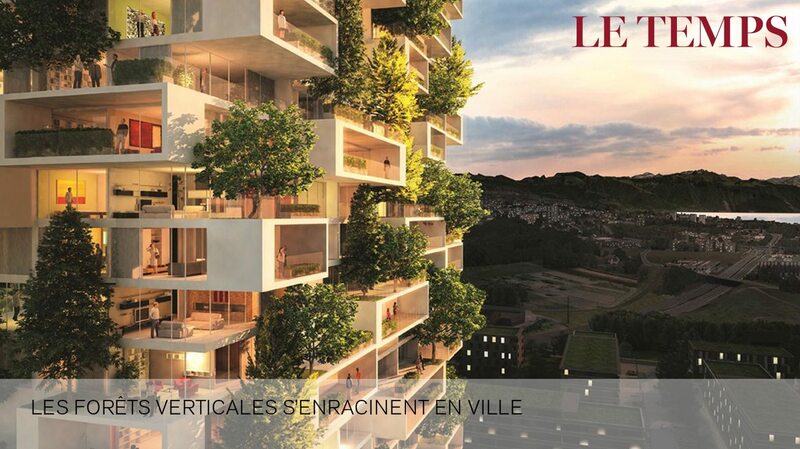 In Lausanne Stefano Boeri Architetti is working on “Les Terraces des Cedres”, which is not just a tower, nor simply a tall residential building. It is the prototype of a new dwelling model, a building that combines the comfort of the apartments, the wonderful view of the lake and nearby areas, with the vegetal world; especially with the various species of cedars that already inhabit the territory. A landmark that can be spotted from Lausanne northern border. It is not so easy to grow a forest on the façade, at altitude and in the open air, in such hybrid ecological environment as the city. “If we are content with 30 cm of soil, we do not grow trees, it takes more than one meter of land on balconies capable of supporting enormous loads, provide irrigation systems, pruning … This is only possible if the vegetation is thought from the beginning as an integral part of the architecture, and not added a posteriori by a technical study office,” agrees with the design approach of Stefano Boeri Architetti the architect and landscape designer Nicolas Gilsoul, who designed the Occitanie tower with Daniel Libeskind.